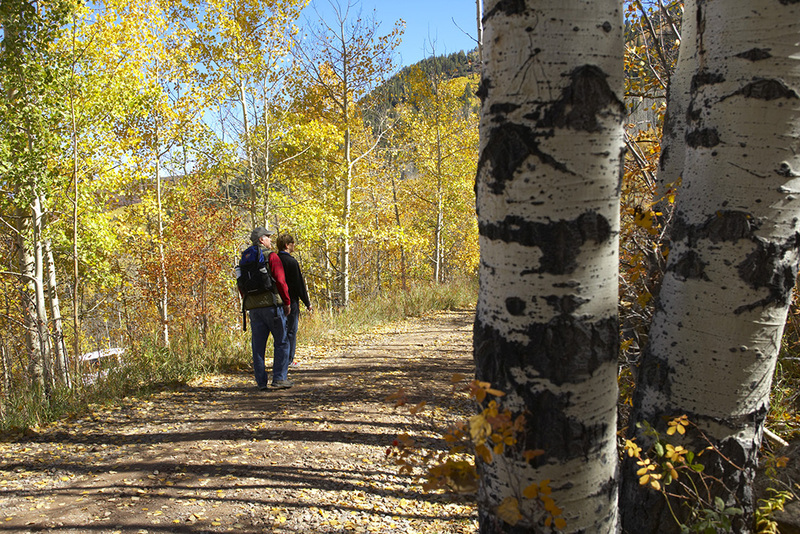 Golden aspens take center stage along Colorado’s Grizzly Creek Trail. Photo courtesy visitglenwood.com. Mother Nature is one complicated woman. The brilliance of her fall foliage depends on whether she mixes the perfect cocktail of summer rain with sunny autumn days and crisp nights that are, ahem, chilled not frozen. But when she gets it right? She just shows off. 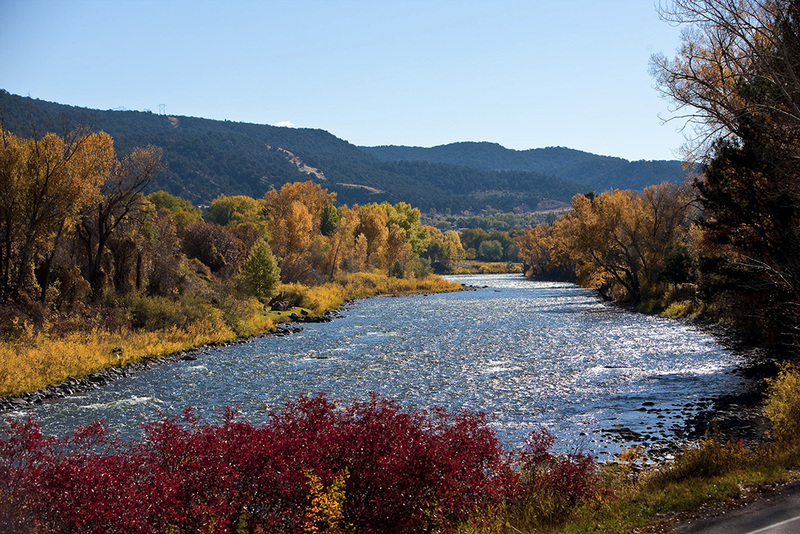 That’s your cue to lace up your boots and tackle these favorite fall hikes. Whether you’re tromping on leaf-covered canyon floors or looking up – way up – to soaring sandstone cliffs framed by fiery fall colors, you can’t miss with these top Southwestern trails. Grizzly Creek Trail near Glenwood Springs, Colorado, offers a year-round soundtrack of running water and spilling waterfalls. But it’s the shimmering aspens that own autumn. This moderate, 7-mile out-and-back trail follows a creek-carved path through steep canyon walls. The Rocky Mountains flaunt snow-capped peaks by mid- to late October, but the best fall colors at Grizzly Creek are found in the weeks prior to that window. 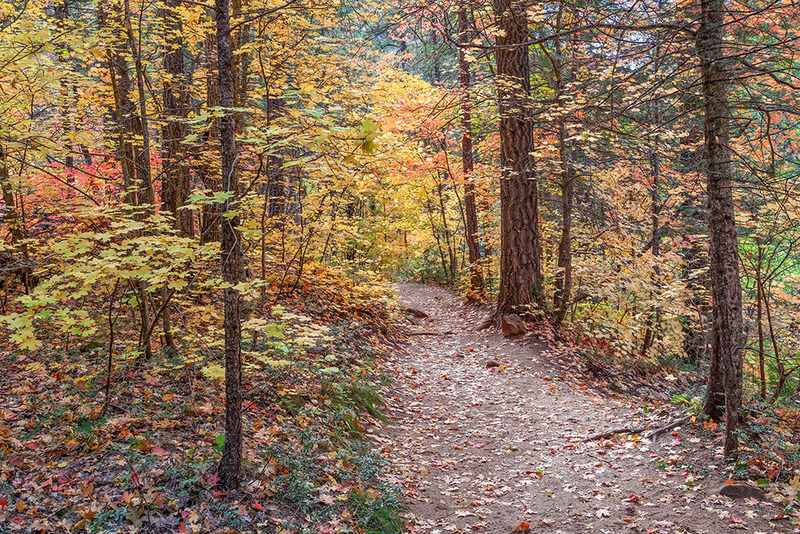 West Fork Trail is a favorite place for leaf-peeping along Arizona’s Oak Creek Canyon. Burrowed under red rock overhangs and towering canyon walls in the Coconino National Forest between Sedona and Flagstaff, West Fork Trail dances a 3.2-mile minuet with Oak Creek. This requires a bit of fancy footwork from boulder-hopping hikers who aim to stay dry during a dozen or so creek crossings. By mid- to late October, the well-marked and maintained trail skirts under brilliant red oak and maple canopies. A few bottom-friendly sandstone slabs beckon those who want to stop and stay awhile. Lost Maples State Natural Area in Vanderpool, Texas, is home to a special stand of Uvalde bigtooth maples, so-named because the “teeth” on the leaves are large in proportion to the rest of the leaf. “They are the closest thing you’re going to see to New England color this far south. They have brilliant, almost fluorescent colors when we have a good year,” says Shawn Greene, park superintendent. Crimson maple leaves aren’t the only eye candy in town. Red oaks and burnt-yellow sycamore and walnut tree leaves dot the park’s 10 miles of trails. Color usually peaks in early- to mid-November.